It was a Saturday night in February 1975: frigid Montana temperatures, impending blizzard, and the church Sweetheart banquet. I was single at the time and living with my adopted sister. We went to the store to gather the items for the two strawberry pies we were to provide for the banquet. Instead of making pie crust from scratch, we bought the all ready made ones, popped them in the oven and made the filling while we waited for them to bake. To our surprise when they came out of the oven...they were more like puff pastry. Neither of us had "forked" the pie dough. Second trip to the store. The second attempt at the crust was a success. The filling was scooped into the crusts and looked lovely. Me, in my infinite wisdom, "Let's decorate them with little whipped cream rosettes," from a can of whipped cream. I get my trusty can of whipped cream and shake it up good and start spritzing the decorative border...only to be met with whipped cream that didn't hold its shape...that ran under the pie crust, making a total mess! Third trip to the store. 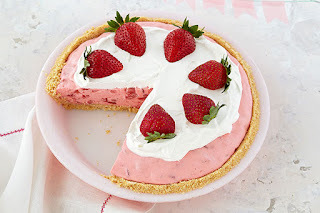 This time, we changed up the ingredients from the given recipes for this dessert from the church ladies, and went with our tried and true recipe...strawberry yogurt pie. 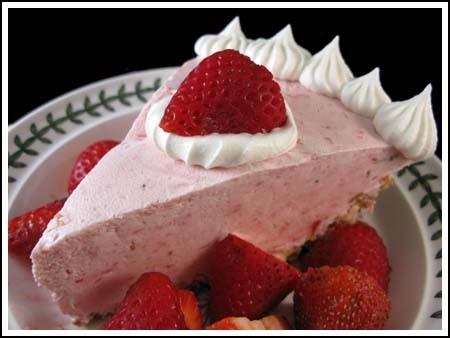 We purchased two all ready made graham cracker crusts, filled them, scooped whipped topping on top and decorated with the strawberries. They looked lovely! We were so proud! We were dressed in long dresses (the thing back in the 70's) and grabbed all of the decorations and other things as well as the pies and headed for the car in the minus twenty degree weather. Put the pies in the car...and my sister promptly dropped a shoe in the middle of one of the pies!!! 1. 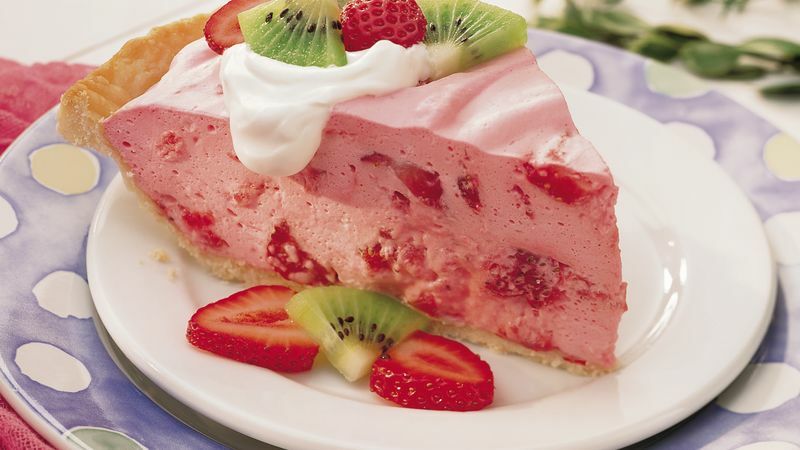 Wash and dry strawberries and chop into pieces, reserving 10-12 berries for garnish. 2. In large bowl mix together Cool Whip and yogurt. The more you mix it, the thicker it becomes. Don't over mix or it won't set properly. 3. Fold in the chopped berries. 4. Pour mixture into prepared pie shells. 5. Garnish with more Cool Whip and berries or however creative you'd like to get.